In 2015, Miami-Dade commissioners passed an ordinance allowing the police to hand out civil citations instead of making arrests for several minor misdemeanors, including possession of less than 20 grams of marijuana. In the three years since, the Miami-Dade Police Department has issued over 10,000 civil citations for marijuana possession, but sent over 5,000 people to jail for possessing small amounts of the drug. While 72% of the citations were handed out to whites, the Miami New Times’ review of 50 randomly selected arrests found that 80% of those cases involved African Americans or Hispanics. “Many factors contribute to these disparities, but one of the biggest is the over-policing that occurs in historically black neighborhoods,” explained Raymer Maguire, manager of the ACLU of Florida’s Campaign for Criminal Justice Reform. In addition, a 2015 memo from former Miami-Dade Police Chief J.D. Patterson explained that people are ineligible to receive citations if they are also charged with a felony, a DUI, a violent crime, or domestic violence. The Rapid Employment and Development Initiative (READI) gives individuals in Chicago who are at high risk of experiencing gun violence access to transitional jobs, cognitive behavioral therapy, and legal and social services to help them change their futures, reports Block Club Chicago. After completing the 18-month program, READI provides six months of coaching to help participants find full-time work. Black men aged 15 to 34 comprised over half the city’s homicide victims in the last two years, despite being just 4% of the city’s population. READI participants are almost all black and between ages 18 and 32. Since the program’s beginning in September 2017, it has helped to employ over 160 men. Conceived by researchers at the University of Chicago and run by the Heartland Alliance, READI is funded by 11 groups including the MacArthur and Polk Brothers Foundations. The program identifies participants by applying an algorithm to data from publicly available police reports and arrest records to predict someone’s risk, as well as through referrals from outreach workers and partners in the criminal justice system. The program leaves room for participants to drop out, and welcomes those returning from jail. During Morris Young’s 14 years as Sheriff in Gadsden County, Florida, crime has roughly halved, juvenile arrests are down by more than 75%, and the county is sending 65% fewer people to state prison than it was eight years ago, reports The Guardian. Young, the longest-serving black sheriff in a majority-black county, where 25% of residents live in poverty, focuses on community policing, decarceration, and re-entry services to reduce recidivism. Since the beginning of his tenure as sheriff, Young has advocated for prosecutors to avoid lengthy jail stays for low-level offenses and for deputies to use discretion when making arrests. “I believe in giving folks two, three, four and five chances to get it right,” he explains. Young also believes that re-entry should begin upon an arrest. The Crossing Over re-entry program in the county jail places incarcerated individuals at job sites outside of the jail during the work day, helping them develop skills and potentially find employment upon release. Young is also working on a pilot mentoring program for children with incarcerated parents, where the children will work with a counselor and life coach who will tutor them on academics, life skills, and social interactions. Some police departments and leaders across the country are explicitly recognizing historical racial injustices and committing to a collaborative change in communities harmed by their policies, according to an Op-Ed in The American Prospect. Authors Samuel Kuhn and Stephen Lurie explore this reconciliation movement in a new report for the National Network for Safe Communities at John Jay College, describing its components and presenting case studies from West Las Vegas, Watts, and Rockford, Illinois. Disparities in juvenile justice contact impact well-documented racial health gaps among adults in the United States, reports Undark. Juvenile detention, for example, increases stress, fragments healthcare during key preventative windows, and makes justice-involved youth more likely to go long stretches without health insurance. As justice-involved youth age, they are more likely to engage in sexual behavior that puts them at risk for sexually transmitted infections, show more symptoms of depression, and have overall worse health. The United States has more justice involved youth than other industrialized countries and while youth of color account for one-third of the adolescent population, they comprise two-thirds of those in juvenile detention. Deena Chisolm, who studies pediatric health at Nationwide Children’s Hospital in Columbus, Ohio, says “midstream solutions” that address post-incarceration health outcomes must accompany “upstream solutions” which reduce the level of contact with the juvenile justice system. “There are a lot of things we can do to mitigate the damage when kids are engaged in the system…But we don’t need to wait until then. Fixing stuff is harder than it is to keep it from being broken in the first place,” Chisolm says. 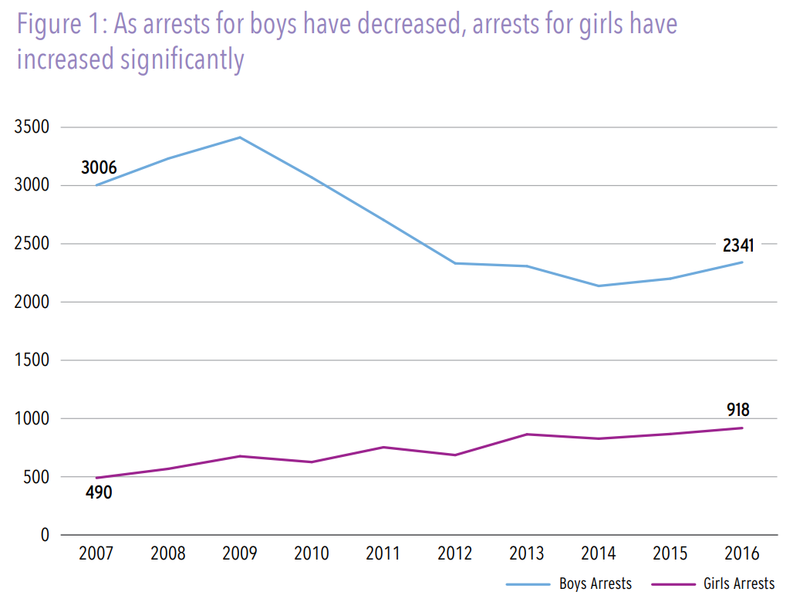 Although arrests of boys in Washington, DC have declined in the last decade, arrests of girls have increased, according to “Beyond the Walls: A Look at Girls in D.C.’s Juvenile JusticeSystem,” a new report from Rights4Girls and the Georgetown Juvenile Justice Initiative. The majority of the offenses for which girls are arrested and detained are non-violent, non-weapons related offenses, particularly for status offenses such as running away. More vigorous enforcement of these offenses is driving the increase in girls’ arrests. While the number of commitments to the Department of Youth Rehabilitation Services has declined for both boys and girls, girls comprise a higher share of youth in the deep-end of the juvenile justice system than in the past. Girls of color and lesbian, gay, bisexual, transgender, and gender non-conforming youth are especially impacted by these trends. In an Op-Ed for the Juvenile Justice Information Exchange, Cherice Hopkins, one of the report’s authors, calls for addressing the adverse childhood experiences disproportionately experienced by black girls, rather than subjecting them to adultification (i.e., viewing them as less innocent and more mature), criminalizing their innocuous behavior through the “abuse to prison pipeline,” or pushing them out of school. Despite studies that show they are ineffective at reducing crime, juvenile curfew laws remain on the books in many jurisdictions. Though they are generally local laws, nine states have state-wide curfew policies. Ivonne Roman of Newark’s Police Department, writing for The Marshall Project, highlights research showing that these laws damage already-strained relationships between police and youth of color and are actually prone to increase offending during curfew hours, perhaps because deserted streets invite crime. Curfew arrests peaked in 1996, at the urging of the Clinton administration, and have declined by 83% in the ensuing years. However, curfew enforcement is among the most racially disproportionate law enforcement practices. African American youth are more than three times as likely to be arrested for curfew violations as white peers.